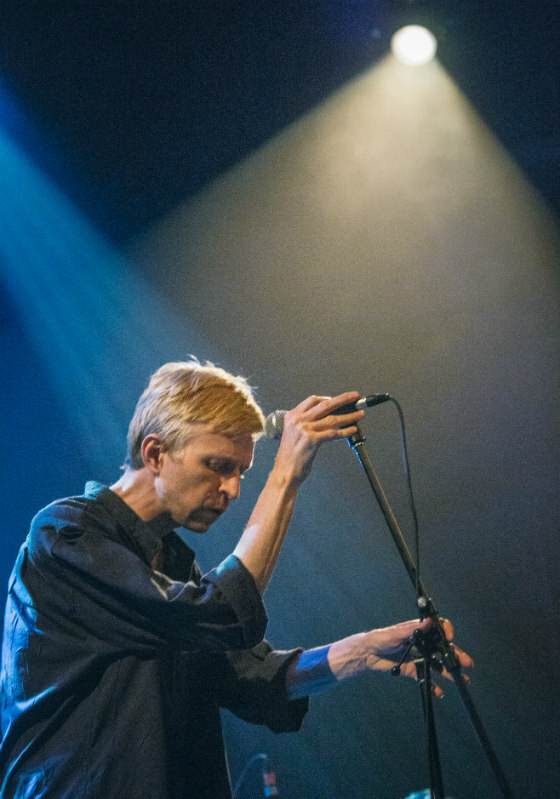 Releasing his debut LP Whiskey at trip-hop's mainstream peak in 1996, Jay-Jay Johanson's set remained steeped in the same downtempo, melancholic mood the genre bred upon its inception. In opening his set with "I Love Him So" and "It Hurts Me So," a one-two punch dealing with of unrequited love, Johanson gingerly gripped the mic stand as he stood stiffly in place to deliver his songs of sadness. While he wasn't an animated performer in the slightest, he remained in complete control of his voice at all times, missing no notes in what was largely a smooth delivery. A drummer and a keyboard player flanked Johanson onstage, with the former taking a few songs to loosen up behind the kit, livening up his own playing during "She Doesn't Live Here Anymore." Helping to modernize the singer's older downtempo textures, Johanson's keyboardist ran backing tracks from a laptop to add bass and horn parts. Even a vocoder made an appearance during the oddly contradictory "NDE," which features lyrical musings on death despite being written in a major key. As downtrodden as the subject matter was, it was hardly a sombre affair inside the Imperial Bell, with Johanson remaining incredibly upbeat and appreciative, thanking the crowd after each song.